A 5-month-old girl presented with recurrent seizures. The child was born at 36 weeks via C-section due to prenatal ultrasound abnormalities of the baby’s brain and head. The patient had left-sided hemi-hypertrophy and a large, red-purple, geometric patch on the left abdomen and hip extending to the back on physical exam. The left-sided hemi-hypertrophy was initially worked up with ultrasound. 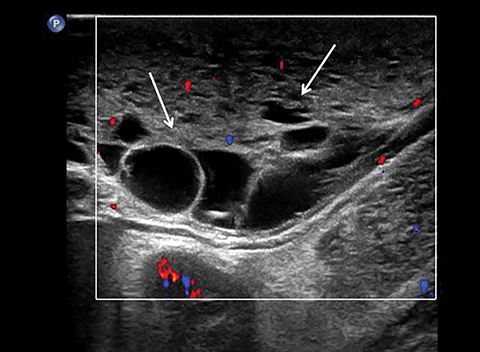 The ultrasound study shows extensive multi-septated cystic abnormalities in the left flank soft tissue (Figure 1). A follow-up MRI/MRA study was obtained. This study showed left-sided diffuse subcutaneous thickening from the left axilla to the left foot (Figure 2). The subcutaneous thickening consisted of macrocystic, multiseptated lesions consistent with lymphatic malformations. 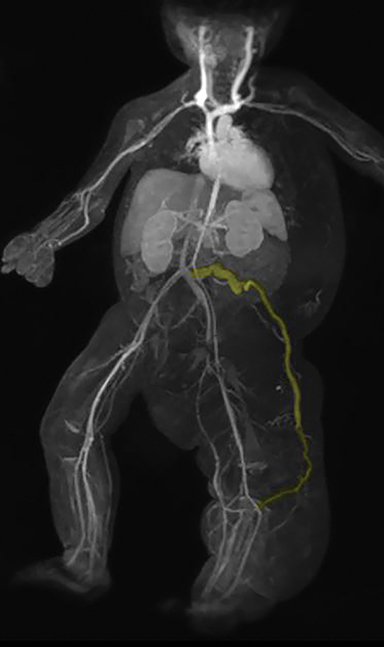 A coronal MRA MIP image showed a lateral marginal vein arising off the left common iliac vein and extending laterally to the left lower extremity (Figure 3). The differential diagnosis includes Parkes-Weber syndrome, neurofibromatosis, lymphedema, and CLOVES syndrome. Symptoms vary according to the severity of the dominant vascular component and its location. If lymphatic malformations are dominant, soft-tissue swelling and enlargement will occur. If venous malformations are dominant, episodes of painful thrombosis will occur. Those with venous malformations often experience muscle cramping or joint pain when walking. Arteriovenous malformations are not seen in KTS. 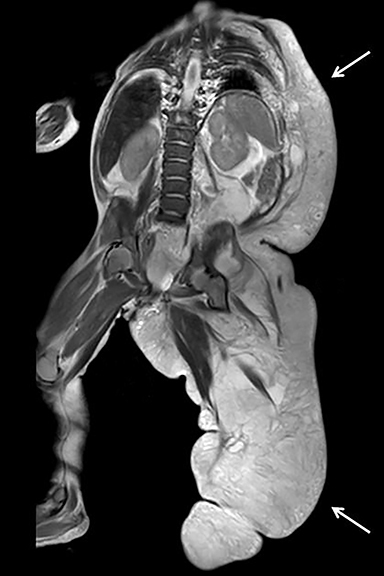 MRI is very useful to evaluate vascular malformations in soft tissues without ionizing radiation. Abnormalities can be identified prenatally. Prenatal ultrasound can demonstrate peripheral and visceral vascular anomalies, cardiomegaly, nonimmune hydrops, macrocephaly, hemi-hypertrophy, and umbilical cord hemangioma. Many less common anomalies can occur and affect the bones, visceral organs and vascular and central nervous systems. Klippel-Trenaunay syndrome presents with a classic triad of hemi-hypertrophy, port wine stain, and congenital venous or venolymphatic malformations. This entity should be distinguished from Parkes-Weber syndrome, which is similar, but features formation of arteriovenous malformations (leading to high output cardiac failure) and no lymphatic malformations. Lachman R Taybi and lachman’s radiology of syndromes, metabolic disorders and skeletal dysplasias, 5th edition, (2006) Mosby, Philadelphia, PA.
https://rarediseases.org/rare-diseases/klippel-trenaunay-syndrome/. Accessed December 5, 2017. Kransdorf M, Murphey M Imaging of Soft Tissue Tumors, 2nd Edition, (2006) Lippincott Williams & Wilkins, Philadelphia, PA.
http://www.kt-foundation.org/ktf_whatiskts.html. Accessed December 5, 2017. Liguori A, Jorgensen SA, Towbin AJ, Towbin R. Klippel-Trenaunay syndrome. Appl Radiol. 2018;47(1):35-36. Prepared by Dr. Liguori while practicing at St. Joseph’s Hospital and Medical Center, Phoenix, AZ; Dr. Jorgensen and Dr. Richard Towbin while practicing at Phoenix Children’s Hospital, Phoenix, AZ; and Dr. Alexander Towbin, while practicing at Cincinnati Children’s Hospital, Cincinnati, OH.